Please click on the above image for the large cover view. BANK SQUARE BOOKS, Mystic, Connecticut, October 11, 2015.
introduced by Richard Harteis, President, the William Meredith Foundation. Fires Eternal Morning is an exploration of the stream of Unconscious memory. Along with the telling of dream stories and childhood perspectives, its aspiration is also to stimulate the reader’s recollection of recent and forgotten dreams. Creating a prose-poem “landscape of dreams,” -- a “dream of consciousness” -- Fires Eternal Morning is a free-metaphor reflecting multiple layers of allegory and irony. 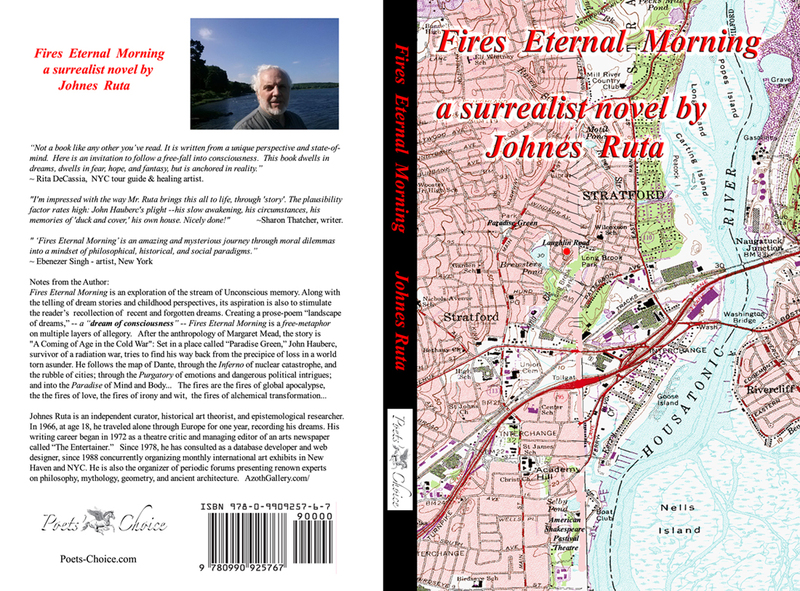 The surrealistic novel “Fires Eternal Morning” by Johnes Ruta is a symphony of human hearts, a prose-poem of Love and Hope, a magnetic tapestry in which are interwoven cosmic tears of infinite darkness and sorrow, and tears of infinite joy, liberation, mystical ecstasy. An 19th century occult map of Atlantis superimposed on a normal map of the Atlantic Ocean. (unedited map) book page 170. Harper & Brothers, 1882.
terrifying images called "Guardians of the Doors." appropriate to the forces to be combated. It was still the morning of fires : the whisper of distant fires which would never stop. This is damned silly, his voice said over the surface of the deep. Finally his mind was speaking again, he could hear the words forming their own sounds, suspended above the vastness of everything gone, waking his attention to the pathetic, puzzling projections on the orange velvet insides of his eyelids. Pictures of past ancient weeks, beneath his weighted lids, consciously focused. A cold gray cloud in the sky above, covering over the thought of a "Cold War," still hanging icily down from the sky. One mid-morning in early October, Miss Brantley was giving the history lesson to her third-grade class: "Christopher Columbus believed that the world was round, but he could not convince anyone else. He believed there was a shorter way to get to China than the long trip through the Indian Ocean. The people of Europe wanted the wonderful spices and silks from Asia, but it was still being taught in the schools of Europe that the world was flat. Columbus visited the kings and queens of Italy and Portugal, but finally in 1492, Queen Isabella of Spain believed him and persuaded her husband King Ferdinand to give Columbus three ships to sail straight to China..."
“What?” wondered Hauberc, but two desks ahead of him, Bill flashed his drawing pad with a scribbled robot cat, and Hauberc broke out laughing. Miss Brantley got frantic, "John Hauberc, you’re going to the Principal’s office in ten seconds !!" That shut him up. Then they had their "Air-Raid Drill," all of them dashing out into the hallway to crouch and cringe against the wall. But Hauberc kept looking over at the wide window panels at the end of the corridor. But they knew what it would be like – they knew there was a huge army helicopter factory, Sikorsky's, only a few miles away, some of their dads worked there – and they knew the big bomb would shatter everything in on us in a terrible shower of glass and fire, or maybe just vaporize them all in a blinding flash of negative atomic light ! It could do that, like Hiroshima and Nagasaki – even bigger. What had happened had been so easy to see coming that no one believed it would really happen. Yet everyone had lived in its fear, knowing its irrevocable outcome -- everything sucked into the Final Conflict, like the rush at the inside of a funnel-cloud running over the long meadow of past time. The world had often come close to the edge of disaster, like just a few years before now when Hauberc was fifteen, and they took their seats on the school bus in the morning looking at each other in terror that they wouldn’t be here to ride the bus home tonight. Kennedy was playing a game of nerves and "Brinksmanship" with Khruschev : would JFK get the Russian missiles out of Cuba or what would happen ? They had all prepared themselves for Annihilation. But after this approach to the brink the danger then receded -- like a great wave on a beach rolling back before coming ashore in his dream. Except "this time" it happened, and the flood tide did swallow up the shore and the inland with it. --- This was the lesson and the quiet nightmare they had lived each day -- that of ten thousand artificial suns suddenly burning up the sky ... that nothing would survive but radioactive rubble and the few survivors left in chaos... They tried to understand the reason it had really happened, but the meaning kept crumbling, even the order of the events. The words in his head, like rhetorical static, finally faded out, just as a forest fire went raging through the hair roots of his scalp, and a rush of creaking fear : his legs were gone, exploded away! ....But no -- feeling began to seep into the veins of his extremities... The skin all over now prickled, dampness pervading everything around him. Reassured by his discomfort, he could feel how his body was huddled, stomach down, into the narrow alley between old stucco garages in an area of pleasant dwellings, the earth beneath him a frozen crevasse. But the place looked like the back yard of his parents’ house in Stratford. From his earliest memories here, he was aware of the expanding universe: At first he had been allowed to play in their fenced-in yard, digging little holes in the ground, making paths across the back lawn to become imaginary roads. Slightly older, he had been allowed out of the gate, to play in the driveway and learn to shoot basketballs through the net on the garage, high above him. Then to walk to the corner and back under the nice pine trees. Eventually, he had been allowed only to explore the whole town block on which they lived, never to cross a road, but to find all the passageways and alleys between the houses and between the garages back to back, and he crawled through all the bushes in everyone’s yards. The kindly ancient retired couples on the block often invited him into their kitchens and fed him sandwiches and soup, and cookies! "Yes," replied Xerxes, king of Prolepsis, "we're sorry for your planet...!" Everything he had learned, everything he had loved, or had hoped to find in his life, now was boiled. That was the last : a deafening squawk. “We're ready tonight.” An unwavering, lost, sober voice, that came up from the depths. Small, dark, empty room, five young people, Westin, Ansgar, Opal, Frederick, and John, as they called him here, sitting on the floor in a circle, around a blueprint of the Communications Reactor. Opal, his friend from high-school whose parents were Russian emmigrees, had left art-school after a year, and taken courses for Electronic Communications, and had worked at the phone company and now here. She had “borrowed” the blueprint. “Are you sure the device can't fail?” his own mouth bubbling, vocal chords vibrating. In the adjacent computer-filled room, another iron-rung ladder leading up to the Communications Reactor above was besieged by a forest of adolescent olive-drab camouflage trees. This Pandora’s Pan-Opticon system which maintained total surveillance, monitoring every conversation spoken, every letter written, scrutinizing every word on the planet, must be sabotaged. --But guards suddenly appeared, using their rifle butts to hack their way through the thicket of saplings. Hauberc thought he must be dreaming, recognizing them as two teachers from his high school, wearing guards' uniforms : short, intense Mr. Read, the English instructor; and old, energetic Miss Wheeler, the eccentric science prof -- tall, thin, and wiry. Read, grammarian and authoritarian more than teacher, advanced through the swarm, but Miss Wheeler recognized the Natural Biology of the situation and casually turned to leave the room. Halfway up the monkey bars, Hauberc watched as Read shoved forward and thrust himself up the ladder in hot pursuit. Arms and kicking feet snaked through the tangle of metal. But the pulling at John’ foot suddenly relaxed as Read’s pallid body slid inert back into the open-armed motley below. “Don't hurt him, just get him out of here!” Hauberc shouted down. What was he doing here, anyway ? I'm agent-provocateur, he said to himself, though there was something in him being satisfied by this membership. And this was what Simone wanted him to do. Following the rivering glacier of adolescents, he passed the dead Read (mr) sprawled on the kindergarten floor. No phrases of pity or feeling came into his head -- the Death Sentence was only an APHASIA of words in the oblique diagrams of meaningless sentences. Only his facial muscles grimaced at the sight, acknowledging the immense scandal of his situation. Down the corridor in a lobby-like area, the same inert teacher was also lying on a wheel stretcher which had been bumped out of the way. Hauberc ambled over and loosened the bonds so that the teacher could escape before the building blew up. Read's thin lips smiled up in gratitude but his Empty orbs stared at Hauberc, broiling him beneath his jacket. Fed up with everything, he turned and trailed after the ebbing glacier of children. Now Hauberc wanted to write a letter home, the thoughts ran through his mind in streams of words to say to everyone at home, and the feelings and memories ran through his body like something electric had made a short circuit, from his nerves to his brain-cells. He wanted to write to each one he had loved before. He hoped they still lived, he prayed they had survived. Dreams of each one possessed him, one after the other, as if they had come into his life. But he wanted them back all at once, especially if he had died, or was about to. He wished that communication would be granted again. All these memories came back to him out of order. There was no really solid ground for Hauberc to walk over these memories, to review the continuity of his life up till now -- all like a path of broken ice flows separating from the glacier of time which were laid out before him to jump across where he could ford, or wait and dwell where the gap was still too wide. Each ice flow of memory formed another part of the jigsaw puzzle of the massive ice-shelf, another fragment of the series of events peopled with the recurrent faces of childhood and those who had led him -- until the disaster had left him on the strand, beached in an unknown but familiar town: Images of walls, doorways, and trails strung together in an amnesiac cause-and-effect of what was inevitable. Walnut grain finish on formica, the walls in a small elevator compartment. Sensation of falling, falling into the Before Time. --- (The time before the disaster had overtaken the Cold War rivalry now was eclipsed by the eruption of fireballs, becoming the exclamation-points of history.) -- Hauberc’s stomach was pitching around in his abdomen, the elevator enclosing a universe soaring skyward in its shaft, and he woke with the cold of gunmetal in his hands. The lift abruptly jolted, his stomach sent careening up into his rib-cage, thrusting his heart into his throat..... The lift’s gates suddenly slid open, blasting sunlight into the elevator compartment, flying splinters of rays, splinters of rage, into the troopers' young faces, bathing the whole compartment in a blinding light. Immediately he was repulsing khaki-clad figures with conditioned antipathetic mutterings. Upon an architectural network of twelve-foot wide open sky-bridges, connecting lofty glass-and-steel office balconies, a cacophony of sporadic gunfire and popping laser-weapons striking flashes all around him.--- The concrete railings provided the only cover : There had come a sudden alert to his unit, sounding shocking and stupid: Invaders from the “Prolepsis Nebula” were descending from a floating fortress. The real Top Secret reason for NATO's elaborate Missile Defense Shield became suddenly obvious. These were not Earthly soldiers. sitting next to the elevator door. Scared beyond thought, Hauberc sprinted to an elevator he saw undamaged by the blast; ran to the shade.....rushing for cover! rushing to escape bullets as well as insanity, bullets as well as hopelessness, and then he thought of Pamela. Still disgusted with himself, his mind attempted to flush everything that had already happened. How did they know that these were alien troopers, as his unit had been briefed? But the red-violent hue of the morning's prologue again enveloped the world. He instead let the grenade slide down the outer surface of the battlement, where it blasted a chink of concrete that glanced off the side of his head. Low-yield photon shells and neutron-radiation had taken a sizable toll on the area, especially in the part of Stratford that lay south of US-1. Most buildings still stood, but as little more than hollowed halls. crates in crumpled five foot high piles by the unloading dock were good cover from stray bullets. was walking from the direction of Stratford airport in the south end of town, but it seemed like he hadn’t been too conscious for miles or days, if he had been flown across the ocean. The transport plane had landed on the runway, let him out wordlessly, and taken off again. The others barely had looked up from their kips laid out cabin floor. Even the radio communications shack seemed like the den at home where he used to listen avidly to the world day and night. Early morning sun was not yet risen above the drab white-cloud ceiling, but shone yellow on the white-washed side of a building. He was kicking his way through the rubble, discarded cardboard and wooden delivery crates. Less than a mile yet to walk, he was still not yet home, when an older voice turned him around to a man leaning by the Meat & Produce - Night Delivery Entrance. “Hey there, son. Where're you going?” The man was holding a rifle pointed at him. “Hey,” he flipped back. Who the hell was calling him that..? Someone was keeping a vigil, an even tone of voice, not much older than he. “Hey, Ho-berk,” another quizzed, “you know anything about these subversives still hiding out around the college.? ” His blank expression held their attention a moment a bit too long for him. “He’s OK. He was military,” the first accoster put in. The group and their rifles had soon jumped into their cars again and gone racing across the wide asphalt plain. Coming upstream, Long Brook Park still looked intact, the trees standing, and the old-fashioned horse-shoe shaped gravel-bottom pool where he went swimming as a child, still pretty. But walking north up Charlton Street hill out the other side, where the houses on the left side overlooked the woods and field on the right all looked abandoned or evacuated. Only a few hundred feet to go… then into his driveway and back yard … and up the back walk of his family's house. Heavy Rain drops were beginning to thump the dry earth. “No more bones or people or Cycle Two. Hopeless pools were before his eyes as he stumbled through the dining room and out onto the screened terrace. The other houses on this shady corner of Laughlin and Charlton looked the same. “If only I had come back sooner,” he thought, she wouldn't be gone too. (He had thought of how he had left her alone to contend with their same non-sense; but she had always adapted so well). now, no one, nothing but despair. If only to see her face. Under a threatening blackening sky outside, a mild gust rustled through the trees, bouncing between upturned silver-green leaves... falling to utter calm in attendance to the approaching deluge. Up and over the step / escaping the thunderhead fallout storm back into the house, back through the living room, over the stair-case landing, around into the kitchen again -- but a noise. the sound of muffled whimpering from upstairs; and he ran up the down-speeding escalator, up to the summit and left into a pink garden room of light perfume and peacock feathers) to sister (who turns around from looking out the window, as the large drops thump the windowsill). It was the next afternoon, the sun shining again almost normally, but still an aloneness of desperation. He wondered whether there were any others searching the town, faces he could trust from his childhood besides those armed vigilantes prowling around. He wandered out of his delusion, with some sense of hope. There was a pleasure walk route he had taken often with Pamela, passing through residential streets of modern Colonial style homes separated from each other by wide well-kept lawns with no sidewalks on their edges... The road skirted the base of a wooded ridge on the left, where streets with names like Wigwam Lane and Anson Street came down the hill. To the right, further out past the modern split-levels, the scenic fairways and greens of a country club golf course sprawled out to the north. The green stucco house up the hill on the left was Pamela's parent's house, the Richardsons./ It seemed now that "virtue had been rewarded," she at least could have gone to heaven in a state of Catholic grace... Still, he wished he could simply go to her house and find her there, and take her in his arms, but it was impossible.. The futile surge rising in his chest was sweeping through his entire consciousness: As much as they both had felt the intensity of love, she had never let him say it or show it, and they had hovered on the verge of consummation, before/ Now there was only emptiness -- now he could never tell her how strongly it had lingered since their separation -- Now at NYU, her last letter, sent before his U2 mission, but received days after it, mentioned someone new in her life, "a really brilliant chemistry student" at Brooklyn Polytech. He had dreamed of her promise to come and meet him in Madrid. -- But a submerged glowing-cobalt zone of total ocean stillness in the wavy deep blue Bay of Biscay, visible from his U2 surveillance plane high above the north coast of Spain -- had engulfed that dream into the depths, the depths of despair. All night moths had crisped themselves on the white-hot pencil-thick spotlight filament outside, sending up milky billows of smoke. Everything in the small, first-floor den of the safe-house was yet intact. Perhaps mummified in the stifling room, unventilated with its windows shut. The sun still made its daily watchman rounds over the dead planet. Seeking anyone …. Seek You… ? and shelves of the large radio rig. But there wasn’t one radio signal to be heard over the air. “That's him! !” Hauberc flicked on the transmitter. Something was finally coming through. -“...Cone, Pine Cone, this is Fig Leaf, come in please.”- They hummed again, louder. But their emulation seemed to have no effect on Fig Leaf, he wasn't even listening. “Why won't he answer?” the second operator asked. and then the soup-thick gray fog swept onto the bare-footed beach.. Nearby friends became Blurs became Shadows became Fossils on the steep sandy slope. Glinting in a shrouded shaft of sunlight, the strait pin he had stepped on protruded from the tender bottom. He lifted his foot and carefully pulled it out, but solenoids flickered within the wound. roaring through firehose veins. “Dead, death. AUDIO READING OF THE BOOK ENDING: CHAPTER 11 "Nadir"